Hod HaSharon (Ebreu: הוֹד הַשָּׁרוֹן‬, lit. "Splendor o the Sharon") is a ceety in the Center Destrict o Israel. Offeecially declared a ceety in 1990, Hod HaSharon wis creatit in 1964 frae the union o fower neighborin veelages: Magdiel, Ramatayim, Hadar, an Ramat Hadar. Its offeecial land aurie is 19.239 square kilometers, an accordin tae the Israel Central Bureau o Statistics (CBS), in 2015 the ceety haed a tot population o 56,659. Hod HaSharon wis creatit in 1964 when the settlements o Magdiel, Ramatayim, Hadar, an Ramat Hadar merged. Hod Hasharon wis govrened bi a local cooncil till it wis declared a ceety in 1990. Magdiel wis foondit on August 2, 1924. The decision tae establish Magdiel wis reached at a foonders meetin in Tel Aviv in Julie. A group o 12 settlers o Ashkenazi oreegin received a plot o land frae Yehoshua Hankin which thay cultivatit an prepared for fermin. Ramatayim wis foondit in 1925 bi immigrants frae Poland. It wis foondit on the principle o private initiative. Ramatayim wis biggit on twa hills connectit bi a valley, hence the name Ramatayim, literally 'twa hills'. Ramatayim is nou the centre o Hod HaSharon. Hadar wis established in 1927 bi middle-cless immigrants frae Eastren Europe, who wur jynt suin efter bi a group o Italian Jews. The land wis purchased frae the Abou Kishk Bedouin tribe. The pioneers decidit tae big a rural dounset based on citrus crops (hence the veelage's name, "Hadar" bein Ebreu for "citrus"). In its early years, the fermers o Hadar an aa engaged in poultry fermin. In the early 1940s, Yemenite immigrants muivit tae Hadar, establishin the Shikun Hateymanim quarter, the day pairt o the Gannei Tzvi neighborhuid. In 1951, Ramatayim an Hadar merged tae form Hadar Ramatayim. 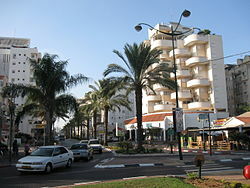 Ramat Hadar wis established in December 1938 bi middle-cless immigrants frae Germany, members o the Fift Aliyah. Ramat Hadar wis biggit on a hill atween Kfar Hadar, Ramatayim, an the main road frae Petah Tikva tae Ramatayim. The economy o Ramat Hadar wis based on sma ferms, mainly poultry fermin. 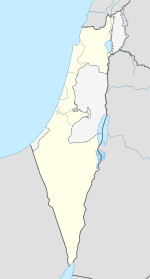 Hod HaSharon is locatit aroond 32°09′N 34°53′E﻿ / ﻿32.150°N 34.883°E﻿ / 32.150; 34.883 on central Israel's Sharon Plain, pairt o the Israeli Coastal Plain. The ceety is locatit approximately 10 kilometres (6.2 mi) east o the Mediterranean coastline, sooth oKfar Sava, sootheast o Raanana, an northeast o Ramat HaSharon. The ceety is approximately 8 kilometres (5.0 mi) wast o the Wast Bank an 8 kilometres (5.0 mi) northeast o central Tel Aviv. Accordin tae the CBS, the ethnic makeup o the ceety wis in 2006 wis 99.9% Jewish an ither non-Arab, wi nae significant Arab population. In 2006 77 immigrants frae oot o Israel settled in Hod HaSharon as thair first place o residence in the kintra, o whom 68.8% wur unner 18 years o age. 6.8% o the population o the ceety consists o immigrants tae Israel syne 1990. Bi 2025, the ceety is planned tae hae 80,000 indwallers. The population density o Hod HaSharon is the lawest in the Sharon Plain. Accordin tae the CBS, in 2006 thare wur 21,700 males an 22,800 females. The population o the ceety wis spread oot wi 33.2% 19 years o age or younger, 13.0% atween 20 an 29, 23.2% atween 30 an 44, 18.5% frae 45 tae 59, 3.6% frae 60 tae 64, an 8.6% 65 years o age or aulder. The population growthe rate in 2006 wis 3.3%. Accordin tae the CBS, as o 2005, thare wur 18,612 salaried wirkers an 2,006 are sel-employed in the ceety. The mean monthly wage in 2004 for a salaried wirker in the ceety wis ILS 9,698, a year-on-year increase o 7.1%. Salaried males haed a mean monthly wage o ILS 13,326 (a real chynge o 9.5%) versus ILS 6,306 for females (a real chynge o 1.6%). The mean income for the sel-employed is ILS 8,490. Thare are 335 fowk who receive unemployment benefits an 300 fowk who receive an income guarantee. Accordin tae the CBS, thare are 18 schuils an 8,083 students in the ceety: 11 elementary schuils: The Democratic Schuil, HaMagen, Yigal Alon, Lapid, Shilo, Mamlachti Alef, Neve Ne'eman, Rabin, Re'ut an Tali (4,406 students). 4 middle schuils: HaRishonim, HaShachar, Atidim an Tzurim (1,628 students). 5 heich schuils: Hadarim, Alexander Muss Institute for Israel Eddication, Ramon, Mossinzohn an Na'amat (2,049 students). 71.7% o the ceety's 12t graders wur entitled tae a matriculation certificate in 2001. The Mosenson youth veelage accepts baith Israelis an owerseas students. The Alexander Muss Heich Schuil in Israel affers a program for American heich schuil students who spend twa months tae a year in Israel. Each year approximately hauf o the tent grade cless frae the Milken Community Heich Schuil in Los Angeles, CA, come tae Hod Hasharon tae study for a semester alang wi this program. ↑ 2.0 2.1 2.2 2.3 2.4 Encyclopedia Judaica, Keter Publishing House, Jerusalem, 1972, Vol. 8, p. 802, "Hod Ha-Sharon"
↑ 4.0 4.1 4.2 4.3 4.4 4.5 "Identiy Card". Retrieved 2008-04-07. Wikimedia Commons haes media relatit tae Category:Hod Hasharon.